As the Open class disappears from the MotoGP grid next year, the non-factory teams are looking to claw the best bikes they can afford and max out their chances to a better placement at the end of the season. Aspar, the team of Jorge Martinez seems to have made the earliest move in this direction, as it looks like he will receive the 2015-sped Repsol Honda hardware after Valencia. With the very strict differences between the current factory and Open class machines no longer in place as of 2016, the non-factory teams will also have to rely on the notoriety of their bikes for attracting the best riders they can. Martinez will receive the bike Marc Marquez is riding, or at least this is what he told gpone. He did not mention whether the bike his team will field is the one Marquez started the current season, but we doubt Honda will want to use the initial 2015 setup. 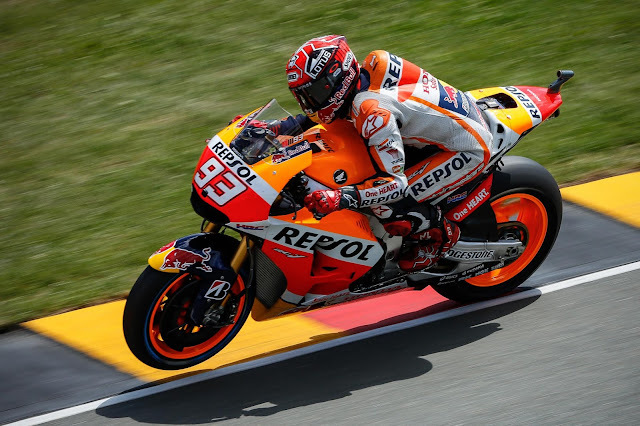 Marquez' mechanics created a hybrid bike for him, using many of the 2014-spec frame components, and it proved to be actually better than the new iteration of the RC213V. We can believe that Aspar will receive the "mixed" machine, while Martinez also mentions that the bikes will retain the seamless gearbox. As to who will be at the helm of the Aspar bikes in 2016, Martinez doesn't offer any clues. Even though for the (now) Open teams, the deals for the next season are closed significantly later than those of the factory or satellite teams, Jorge Martinez seems to be eyeing some changes. He mentions having talked to various riders, such as Scott Redding, Tito Rabat, and Sam Lowes, and this tells us that at least one of the current riders will have to find a new team. Choosing between Eugene Laverty and Nicky Hayden sounds like a rather tough choice. On one hand, Laverty has earned 7 points in his MotoGP rookie year, as opposed to the much more experienced Hayden, who only has 8. On the other hand, some believe that having Hayden on a factory machine could be the change he was waiting for to show that he still has what it takes to battle higher in the field. Either way, we start to feel the anticipation ahead of the 2016 MotoGP season, with so many things that are about to change on the grid.